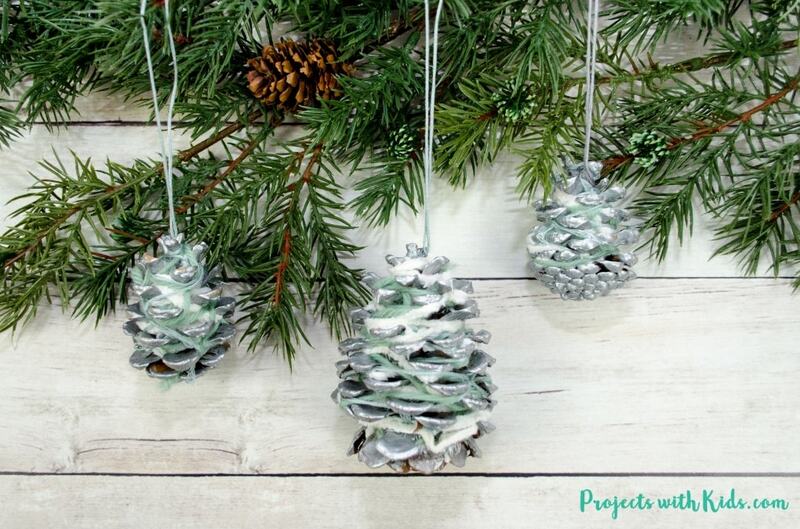 These pinecone ornaments are so simple and beautiful! I love the icy, wintery look of these ornaments. 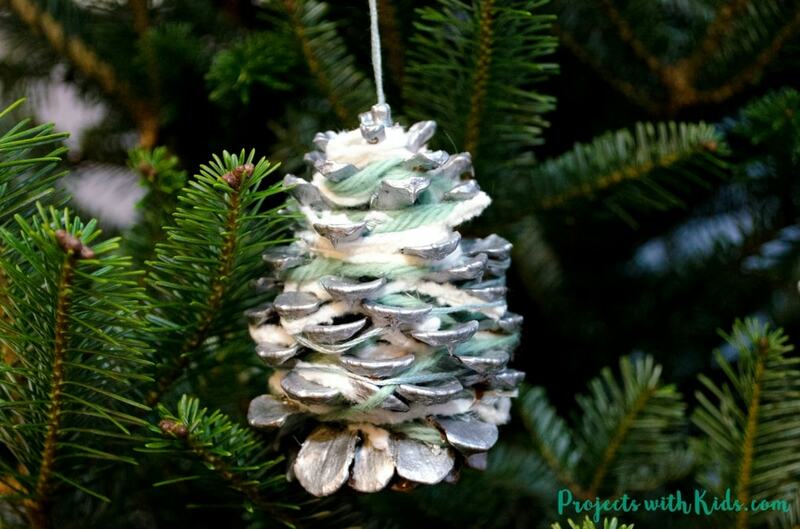 They would make a perfect Christmas craft for kids of all ages and a great fine motor skills activity. Both of my kids took their time carefully wrapping their pinecones in yarn with multiple layers and colors. They really turned out great and are excited to hang them on our tree this year. 1. 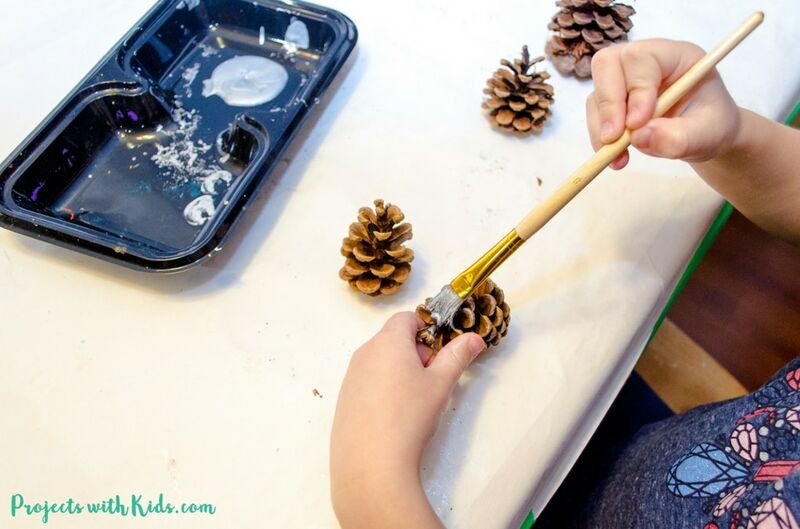 If you are using pinecones that you have collected outside, you first need to prepare your pinecones properly so that you don’t leave any bugs in your pinecones while you are crafting with them. 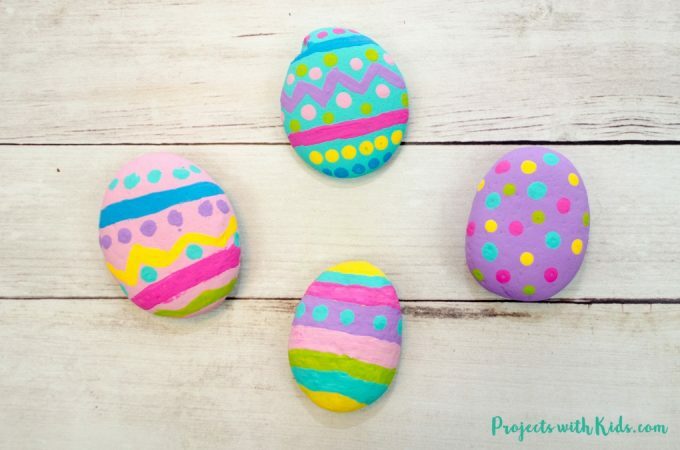 This is super simple to do and you can find some easy instructions here. 2. 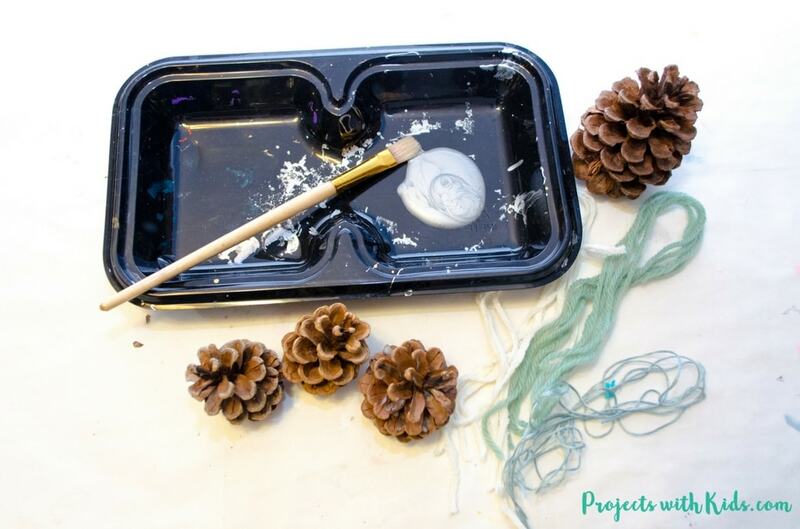 Once you have prepared your pinecones properly, set out your silver paint on a tray and let your kids paint the pinecones silver all over. We didn’t worry too much about painting the bottom of our pinecones, but you could definitely paint the bottoms as well. 3. Let the silver paint completely dry before moving on to the next step. 4. Cut different lengths of yarn in whites, creams, wintery blues, and greys, we even used some embroidery thread in our pinecones for some different types of texture. 5. 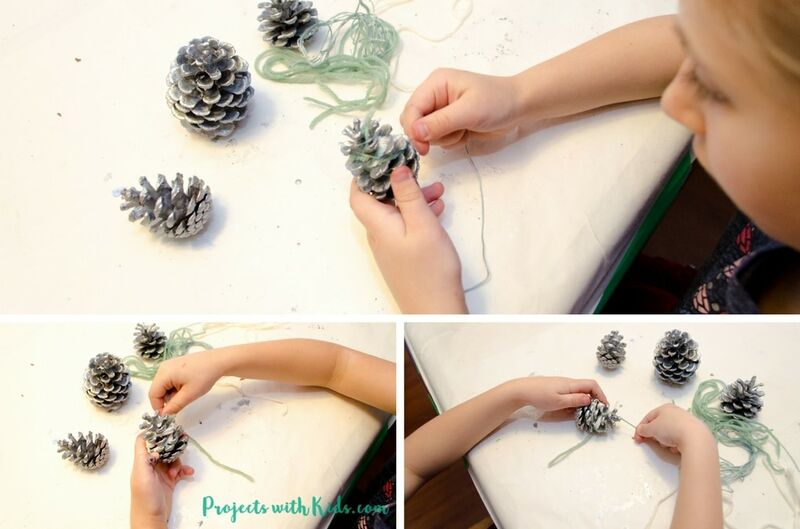 Let the kids wrap the yarn around their pinecones. There is no right or wrong way to do this, kids can use their creativity and wrap the yarn however they would like. It always turns out beautifully! 6. 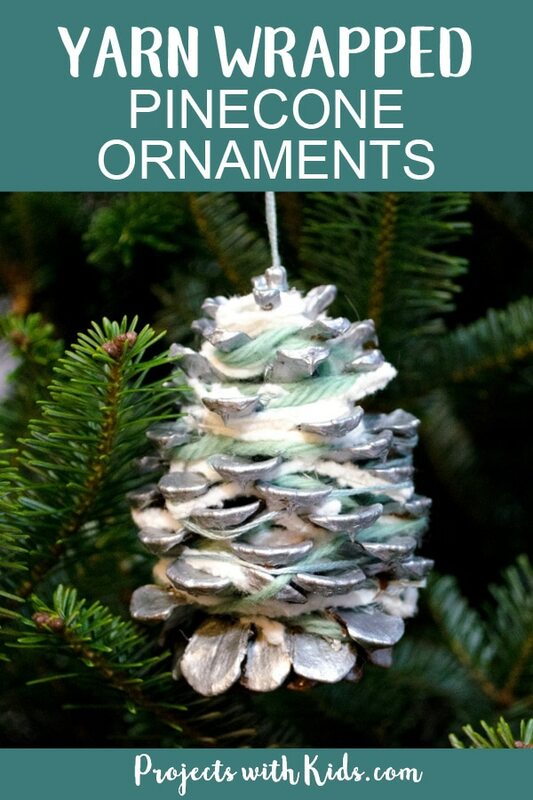 Once you have finished wrapping your pinecones with yarn, take some yarn and tie a loop around the top so you can hang all of your beautiful creations on your Christmas tree! These pinecone ornaments look great on our tree and I know that we will love unwrapping them and hanging them up year after year. They would also make a great kid-made gift idea, my kids are excited to give some of their ornaments as gifts to family this year. We love using pinecones to craft with and these beautiful pinecone place card holders are the perfect decor for your fall holiday table. Change the color of the yarn, and they would be perfect decor for your Christmas table. If you are looking for more Christmas crafts, you might also like these easy kid made wreath ornaments with paper straws. 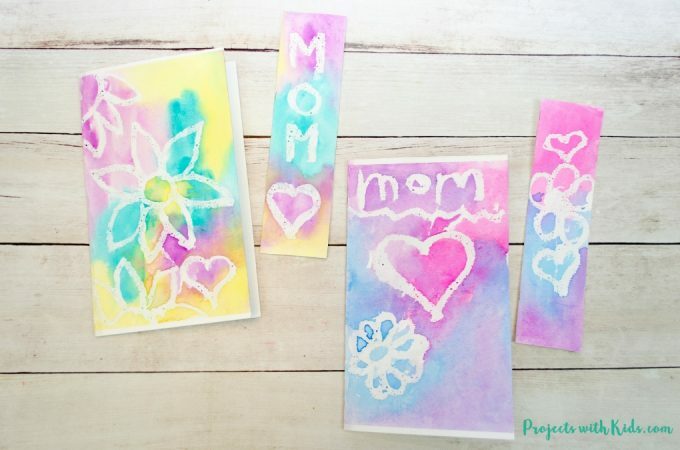 They are so fun and easy for kids of all ages! Very cute. I love the colors you chose for the yarn. I love the silver! I think they will look beautiful on the tree! How pretty! 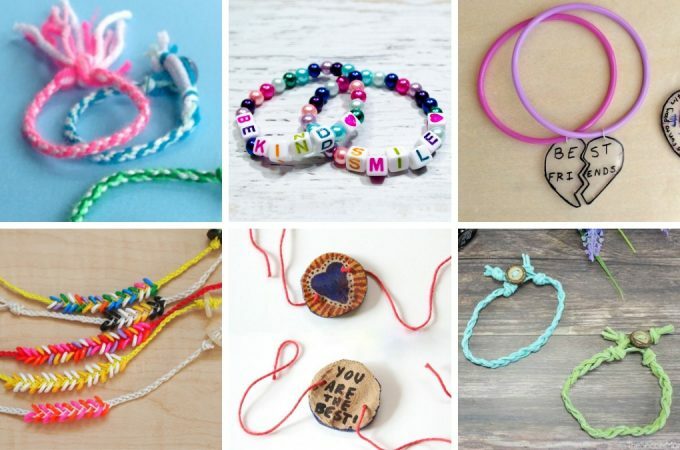 I love the idea of making something with the kids that can be kept and used from year to year. These are so beautiful! 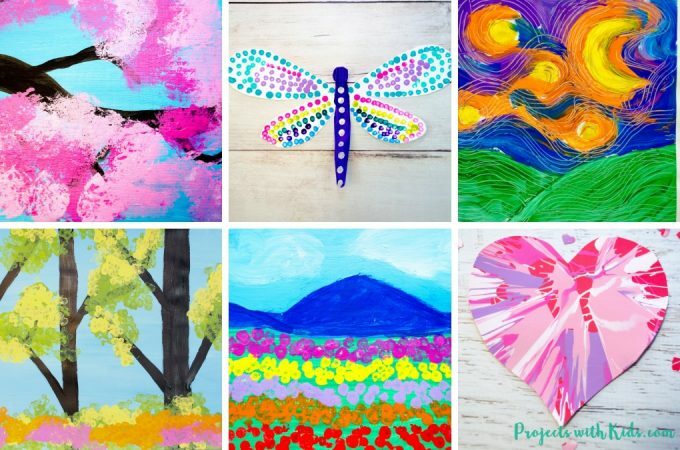 This would be such a fun project to do with my daughter! Thank you Corey, my daughter sure enjoyed making these.